The Next Level Armament NLX223 Ambidextrous Charging Handle, made from 7075 aluminum, features two over-sized “ears” that provide a greater surface area to grab onto. At first glance, the NLX223 has a luster black finish while the Raptor has a dull black matte finish. Both have white laser etched logos and writing on the top of the handle. The NLX223 had minor visible tooling marks which do not appear to affect the functionality at all. The NLX223’s ambidextrous “ears” are larger than the Raptor’s and are evenly sized whereas the Raptor’s are both smaller and the (shooter’s) left side of the charging handle is smaller than the right. Though this will come down to the shooter’s preference, I found that the NLX223’s large “ears”, particularly the left side, as I am a right handed shooter, tends to get caught on kit when slung across the chest. Both the NLX223 and the Raptor provide similar ambidextrous functionality with two movable “ears” that can operate the charging handle from either side. The NLX223 “ears” appear to operate in tandem, regardless which “ear” is pulled to the rear while the Raptor will only work in tandem when the right “ear” is pulled and the left operates alone when operated normally. During operation of the NLX223 and the Raptor there is a noticeable difference between the smoothness of the two. The Raptor provides a smooth and quiet operation while the NLX223 seemed to “bind” during operation and produced a minor “squeaking” noise when the right “ear” was used, but not as prominent the left. During a fast “rack” of the charging handle, the squeaking is not readily noticeable. During “racking” drills, the NLX223 caused some nominal marring on both the lower receiver (area above the buffer tube threads) and the area of the upper receiver where the charging handle slides in and out of. This was caused by the inside bottom of both “ears” as there were mar marks on the charging handle as well. This may or may not be a deal breaker for some. The NLX223 is available for $80 from Next Level Armament. Next Level Armament also offers the big brother to the NLX223, the NLX308, which is designed for .308 AR’s. Similar in design and functionality to the NLX223, the NLX308 is available for $90. I recently changed my duty holster over from a Safariland SSIII to the Safariland Model 6360-832 Holster. After almost a decade of drawing a handgun from a SSIII holster and defeating the retention mechanisms one way, it took a few hundred drawing repetitions to change my “muscle memory”. The end result was well worth the efforts. Unlike some other holsters that require the draw to take on varying angles and twists, the ALS holster’s draw is straight up after retention devices have been defeated. Additionally, the draw from a seated position, especially in a patrol car, is much more effortless than with the SSIII, which requires the handgun being rocked to the rear a fraction of an inch to defeat a level of retention, which usually means pressing it into the seat back. A few of the benefits to note are the increased speed of the draw with the ALS compared to the SSIII as well as the security of conducting an immediate re-holster of the handgun. With the SSIII I had to get at least one of the snaps fastened to semi-secure the handgun, while with the ALS all I was required to do was to “drop” the handgun back into the holster until it “clicked” or locked into a secure position, or as some would consider the first level of retention. The ALS holster is considered a Level III holster, though it is also available in a Level IV with the addition of an optional sentry installed. As viewed in the photo above, the first level of retention is underneath the hood with a “thumb break”, the second level being the hood, and the third being the hood guard, which looks like a shield to the left of the hood as pictured. The purpose of the hood guard is to help prevent a gun grab from the front of the individual wearing the holster. Not all body shapes are the same and some officers have found the hood guard to be uncomfortable. For them, we have installed a sentry as their third level of retention in lieu of the guard. The finish that I chose was the STX Plain Black and has held up fairly well over months of use and abuse. There is one blemish that you can see on the bottom of the holster (pictured above), though in my honest opinion, it is just part of doing business. The STX Plain Black finish has held up better than the previously issued SSIII holster’s finish from the holster that was initially issued to me a decade ago. Though in the above photo, the holster looks huge, I have not had any issues with the size of the holster. Additionally, I know that some will make mention about the HSGI Extended Pistol Taco Pouch holding the ASP Baton being too close to the handgun, effecting the draw. When worn, the holster and the baton pouch are spread out enough due to the curvature of my body and they do not interfere with one another. As seen from below, the light is not covered and the bottom of the holster is not sealed off. I have had no problems with the light being damaged or even exposed to any hazards, however, with the opening, water and other minor debris cannot build up as it will drain out of the bottom of the holster. For those who participate in NLTA (Non-Lethal Training Ammunition) Training (aka “Simunitions”), be mindful that the bottom of the interior of this holster has a “guide rod” that inserts into the barrel. This “guide rod” is to maintain the handguns proper positioning and security inside the holster when the light is not installed. With the majority, if not all of the available “Sim Guns”, the barrel’s opening is off-set as not to allow live “real world” ammunition inadvertently being chambered and having the firing pin strike the primer of a live round. That being said, the “guide rod” will not fit into the barrel of the “Sim Gun” and will not allow for a proper “seating” of the handgun in the holster. This has never proven to be a deal breaker, but something to be mindful of when you cannot completely holster and secure your handgun during training. Overall, I am extremely pleased with this holster and would highly recommend it to any Law Enforcement / Military / Security personnel that require a secure and fast means of carrying their handgun in hazardous environments. The holster retails between $147-$217 depending on options. This is a fair price to pay considering the value of being able to retain your handgun when it truly matters. For more information, check out the Safariland webpage. I recently downloaded the new Gunstruction App, which is available in the Google Play and iTunes Stores. Since I am an Android guy (sorry Apple lovers), I can really only speak of my experiences on my LG G2. As with any software and different hardware and operating systems, your experience may vary. I have always loved the idea of what Gunstruction does. If you are unfamiliar, you can basically take real world AR parts and build up a mock 3D rifle to see what your project rifle would end up looking like. The program will also let you know if a part is not compatible. I had the chance to talk to a few of the Gunstruction guys at this past SHOT Show and they are truly great, down to earth guys who have a passion for what they do. As I first opened the app, the “Downloading” screen was there for awhile. I thought that it was an initial system set-up causing the lag, but I later figured out the error of my ways….more on that in a bit. Since I just downloaded the app, I am unsure at how often promotional announcements will show up, however, here was an announcement for the “Build it Win it” contest that is currently going on. Once the app loads, this above image is what you will see. The “New Parts” option will show you what new parts have been added to the program, “Build” will give you a starting point on the specs of a new rifle build, and “Load” will allow you to open a previously saved rifle build. Once you select the “Build” option, you will get an expanding menu pictured below. Showing the expanded menu for the “Build” option. NOTE: SAVE YOUR WORK!!!! Closing the program or backing out will cause you to lose all of your progress. Make sure you save your progress periodically. 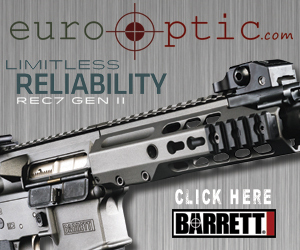 On the home screen menu if you select the “Feature Build” option on the upper right corner, you will come to this, the current “Featured Build” which is a Rainier Arms RUC Mod2. I personally have one of these rifles and absolutely love it. I figured I would check out the apps functions with a gun I knew. When you select the “Explode” icon on the build screen it will give you the options to select a portion of the rifle by further exploding it down into smaller pieces or by selecting a “bundle package” to start with a pre-built option. Oh look, that pesky “Downloading” bar is back….and it stuck around for quite some time. Now one of the best parts of having a smart phone is being able to lay in bed and play on your phone….but when you have to wait, it can become frustrating. Figuring that since this is such a graphics heavy program, it must have to pull the information off a server, requiring a good bit of bandwidth usage. But I’m connected to my home’s WiFi, right? Nope. I was trying to pull all this graphics info off the cell towers. Didn’t work as ideal as I was hoping until I turned the WiFi back on. WiFi back on = no more lag. Remember, your mileage may vary and you may have rock-star cell service better than mine and experience no lag when working off of the towers. When building a new model, or even altering a pre-existing rifle, you can choose between a very wide variety of options from many different manufacturers. I did have a little difficulty in selecting between the different options, such as the different lowers above. I was able to eventually select the option that I wanted, though it did take a few taps of the screen to get there. With each build you can add a huge selection of accessories to see how your rifle would look in the end as well as check the cowitness of your BUIS and Optics. Did I mention to save your work? You can also copy and share a URL of your gun to share with others. One of my favorite features of this app/program is to be able to “paint” your rifle and parts. It surely will save you a lot of time an money if you are one who cannot make up their mind. I like how there is a camo option, but I wish there would be more selections, especially the ever popular Kryptek patterns. You can also check out the rifles statistics that will show you the length, weight, cost, and length of pull in inches. The “Part Detail” feature will break down more specifics of the part used on your rifle build. When you are the “Save Gun” feature….did I mention to save your work?….you can find a location to buy either your rifle or the individual parts through the “Current Gun” tab at the top of the screen. My selection directed me to Rainier Arms which is always a top choice for me to purchase from anyway. Additionally, you can save your work in picture format to share. Gunstruction periodically has contests where these photos will be your entry and there is usually a stipulation of the cost you must keep the rifle under and certain parts that you must use to complete the build. In the world of Multi-Tools and their use for weapons maintenance, especially the AR-15, nothing can hold a candle to the Multitasker® Tools brand, in particularly the Series 3. Out of the box the difference can be clearly seen and especially felt. Other multi-tools that I have owned in the past have “rattled” and did not feel robust. The Series 3 looks like and feels like a battle tank waiting to face whatever skirmish that can be thrown at it. Though the weapon-specific design of the Series 3 will probably not serve you as well on a camping trip in the woods, it will however prove to be a great first resort for in-the-field weapons maintenance, adjustment needs, and basic armoring tasks when conventional armorers tools are not readily available. Prior to opening the Series 3, one of the first things I noticed was the G10 scales used for the grips. These grips are extremely slip-resistant without being uncomfortably abrasive. To really feel how robust this tool truly is, all that needs to be done is to open the pliers and feel how precise the machining is. The Aluminum-Bronze washers provide for smooth operation when opening the pliers while the tight tolerances create a positive pressure that ensures that the Series 3 will stay closed until it is intentionally opened. I appreciate the feature that allows the accessory arms to be opened while the tool is fully closed, thus eliminating one step when needing to deploy one of the tool options. The sharpened D2 tool steel blade firmly locks into place and does not offer any “wiggle room” once deployed. The blade is extremely sharp, so remember not to leave this around your little ones. The 3/32″ pin punch can be used to assist with difficult AR pivot and take-down pins and the removal and installation of the fire control group pins as well. While it can be used to break down your Glock to an armorer level as well, Multitasker® recommends not using it to pry off the Glock magazine floor plates. Common sense applies here as there can be too much side-wards pressure on the pin, causing it to snap or possibly damaging the threads holding the punch on. The threads holding on the pin punch are sized at 8-32 (male threading) to work in conjunction with an OTIS Technology cleaning kit. The magnetic 1/4″ bit driver comes with the AR15 front sight tool installed. The magnet is strong enough to keep the bits from falling out, but not impossible to remove. When the bit driver arm is closed with a bit installed, the grip housing ensures that the bit will not inadvertently fall out. The Series 3 consists of quality CNC machined pliers made from D2 tool steel, a 3/8″ and 1/2″ hex wrench, a dual lug castle nut spanner wrench and screwdriver, a 3/32″ pin punch with 8-32 male thread (OTIS cleaning kit compatible), a radiused tip carbon scraper, a 3″ D2 tool steel knife blade (plain or serrated), a 1/4″ magnetic bit driver with M16A2-style Front Sight Post adjuster and a removable pocket clip. A bit carrier with commonly used hex bits are also included. The only thing that I think that I would have like to have seen included with the Series 3 would be some sort of pouch or carrier that would allow for the tool and bit carrier to be carried together. I can understand that many people will have their own preferences on how to carry their Series 3, but even the ability to purchase something specific to the Series 3 as an add-on accessory would be a nice option. Overall, as an AR-15 enthusiast, armorer, and firearms instructor, I highly recommend this tool for anyone from the basic weekend shooter to the soldier on the battlefield. For more information on Multitasker Tools, visit them on their WEBPAGE or find them on FACEBOOK or INSTAGRAM. Hitting the tactical market in 2007, Elzetta Design has become one of the most respected names in high quality and durable lighting. Improving drastically with LED technology over the miniature incandescent bulbs of the past, handheld lights are no longer what they were a decade ago. Available in three different body lengths, the Alpha (1 cell), the Bravo (2 cell), and the Charlie (3 cell), the configurations of the Elzetta lights are nearly endless by changing the lens, bezel and tail cap options. Alpha Light shown with optional Speed Clip and makes for a perfect EDC light. As you can see from the options above the lumens available on the Elzetta lights range from 235 to 900 lumens. There is a misnomer with how lumens work and some believe that lumens=brightness, when in fact lumens are how much light is thrown from the lens regardless of how wide the spread is. I could reinvent the wheel in explaining this idea, but Elzetta’s Dave Barnett does a much better job of explanation it in this video. You could just take my word that the Elzetta lights are really tougher than nails, or you could watch a few videos showing proof. The first video is one I shot at SHOT Show 2011 which shows Dave Barnett using an Elzetta light, while turned on, as a hammer to punch a nail into a 2×4. The remainder of the video shows Elzetta’s product line as it was 3 years ago. There have been some updates and additions since then. The second video is from Dustin Ellermann, you know, the guy from Top Shot, where he takes an Elzetta light and drops it out of a helicopter from 300 feet onto concrete. If these videos are not proof enough, there are more, like the one where Dave Barnett submerges an Elzetta light under water, disassembles it, and reassembles it under water with full functionality afterward. Overall, these lights are solid, will hold up to a lifetime of use and abuse, and will provide a lot of light throw when and where you need it. I personally carry a Bravo light with a High Output AVS Module (600 Lumen) on my duty belt and only need to replace the batteries (2x CR123’s) about once a month while working swing shift. I’m sure I would need to replace them more often if I were working nights. Elzetta also offers various mounts for their lights such as the ZRX Lightweight Mount and the ZFH1500. Both of these mounts will accept a 1 inch in diameter light. The ZRX will fit in any picatinny rail slot and any weight gain with this mount is not noticeable at just 1.1 oz. Elzetta ZRX Lightweight Light Mount The ZFH1500 Light Mount allows the light to be mounted in the 6 o’clock position under the barrel while attached to the open space of a standard A1 or A2 front sight base. The tail cap of the light is exposed in the back, allowing for ease of use. A pressure switch tail cap can also be installed on any of the Elzetta lights. Elzetta ZFH1500 Light Mount with Bravo Light. If you are looking for a light that will last you long enough to hand down to your grand-kids, then Elzetta is a great option for you to rely on for years to come. For more information on Elzetta or to purchase any of their products, please visit http://www.elzetta.com. Grey Ghost Gear has brought a new plate carrier to the market. The Minimalist Plate Carrier has been dubbed a “lighter and better plate carrier with a minimum of thrills, but a ton of function”. This new play carrier was designed to carry 10×12 hard plates and large ESAPI plates. The carrier offers six rows of MOLLE/PALS style webbing and built-in matching loop material on the top three rows for the option of attaching patches or ID panels. Discreetly placed on the front side of the carrier is a stash pocket. That makes perfect storage for small items that may be needed readily. The Minimalist Plate Carrier is only made in one size to fit most body types with the shoulder straps being adjustable and integrated elastic side straps, giving you the ability to keep a snug fit, while still allowing for unexpected dynamic motion. Designed to stand up in hard use situations. The carrier is constructed from MIL-SPEC materials and is lined with air mesh for comfort and breath-ability. The plate carrier is available two colors; Coyote Brown and Multi-Cam. True to the name, the Minimalist Plate Carrier is not going to offer you an overabundance of options or features, but for those who have a need for a carrier that is not going to overburdened them, especially those who need to be in environments with restricted or tight spaces will find the carrier to be a good solution. Individuals that find themselves working in a Personal Security Detail with the need to have a lower footprint with the amount of gear that they are wearing a find at this plate carrier is easily concealed, while still affording them the protection of heavy plates. Additionally, dignitaries who have to work in or travel through hazardous environments may find the use of this minimalist carrier to be less restrictive and overly noticeable. Donning and doffing this plate carrier is a cinch with the two side buckles securing the front and back portions of the carrier together securely. I found the adjustment of the shoulder straps and the side straps to be very simplistic and quick to accomplish. Though this is a minimalist carrier, I found this carrier to be extremely comfortable with the interior padding on front and back sides of each panel. Though some may not like the fact that the plate is visible from the exterior of the carrier and allows more functionality with different heavy plate types and does not add more material where it is not needed. Grey Ghost Gear is offering this plate carrier at an affordable price for any wallet, which is currently offered at a sale price of $105.80. This review was originally posted on Weapon Evolution.